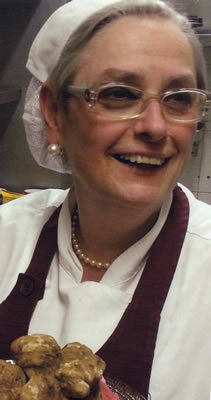 Those of us who love Italian food – and which persons of sound mind and palate do not? 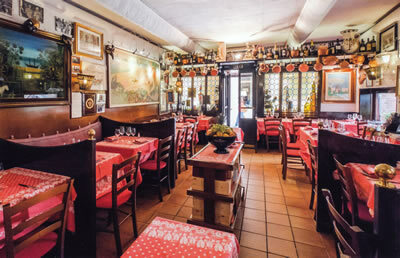 – are always searching for The Perfect Italian Restaurant. Its food, of course, must be wonderful and must be traditional. Its service must be friendly, efficient and full of enthusiasm. But there must also be something else. It has to do with atmosphere and ‘ambiance’. Perhaps the best expression might be ‘a sense of excitement’. The Perfect Italian Restaurant must be exciting. I think I have found it. Therefore mark well these words: The Perfect Italian Restaurant is in Venice. 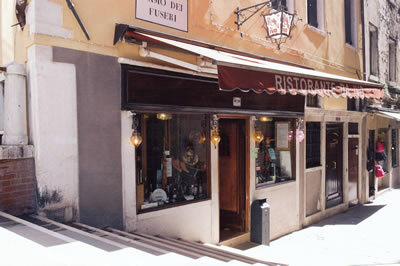 It is the Ristorante Da Ivo. Of course, I am not the first person to make this discovery. The rich and famous made it long ago. For persons who achieve fame because of their work on the stage, in the film studio or on the concert platform are, at least in one respect, exactly like the rest of us. They like a good meal. 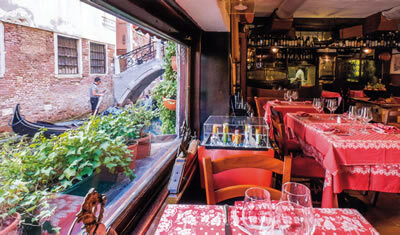 When they are in Venice – and famous people do tend to be in Venice – they therefore quite often head for this small dining room, a short walk from the piazza San Marco. (In fact, there is no need to walk, for the establishment has its own door onto the adjacent canal, and so can be reached by boat.) The eponymous founder of the Ristorante Da Ivo was Ivo Natali, a gentleman from Tuscany, and the food here has therefore, since the opening in 1976, always combined the cuisines of Tuscany and Venice. We can be sure of this consistency because, remarkably, the cook – I think she prefers the word ‘cook’ to ‘chef’ – has been the same lady since the very first day. Giorgina Mazzero (pictured) is diminutive in stature but huge in talent. 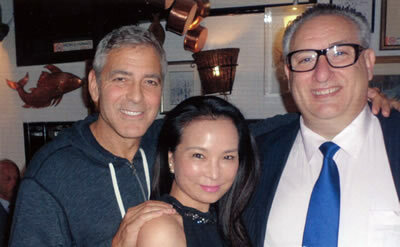 Giovanni Fracassi (pictured, with a film star and a lady) took over the restaurant in 2005, and the two of them ensure that today the Ristorante Da Ivo is a wonderful place for a meal. And on their menu card are printed the magical words to which much of their success surely must be attributed: “Whatever you desire, ask for it and we’ll do our best to satisfy you.” Wouldn’t it be a better world, if every restaurant approached their customers in the same way? I entered – through the street door, having walked – to find myself in an intimate space, busy and welcoming. This crowded (but not uncomfortable) atmosphere has much to do with the sense of excitement to which I have alluded. And then there is the large painting which dominates the room: of a naked lady with ginger locks, who is nursing a cockerel by a pond. I had very much the sense of “This is where it’s at”. I was shown to my table by Le Patron, for Mr Fracassi is very much in evidence in his restaurant (another reason, I would judge, for its popularity). Before me on the red tablecloth stood good glassware by Stölzle. The waiters in their black shirts moved this way and that – smiling and efficient – looking after diners who were clearly having a jolly good time. And I, too, soon had a smile on my face, for I was inspecting the objects which always set a gourmet’s pulse racing – white truffles. It was the season for the divine fungus, and the aroma reaching my nostrils was so intoxicating that I at once made a firm decision: my dinner must include white truffle. And it did. But first I began with the gorgeous simplicity of fried porcini mushrooms. 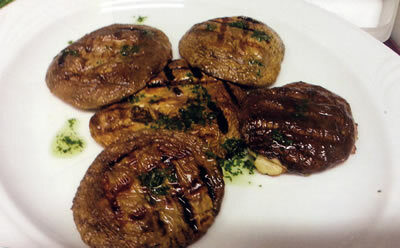 Italians are enormously proud of their porcini mushrooms, and so they should be. These were wonderful: soft, luscious and bursting with earthy flavour. Then simplicity reached its peak: soft and yielding tagliolini with lots and lots of white truffle shaved over the top. You can forget eating pâté de foie gras to the sound of trumpets: this is what I want Heaven to be like. Such clarity, such ravishing subtlety, such tender complexity… and all on one plate. I could have gone on to dish after dish of this heavenly treat. But that would have been silly, so I turned to some beautifully tasty fillet of beef, sliced and served with olive oil, garlic and rosemary. Even this bald description makes one hungry, does it not? With this beef came excellent roast potatoes. I love my potatoes, and these were very good indeed. Towards the end of my main course, my eye caught sight of a chocolate cake, on its stand in the middle of the room. With a slice of this ravishing confection did I end my meal. And it was made even more delicious by the accompanying wild strawberries. There are few more satisfying combinations than chocolate and strawberries. Delicious. (These four courses were 170€.) This was a wonderful, old-fashioned meal. The wine list – the work of Mr Fracassi – has about 150 offerings from Italy and France. Prices run from 30€ for the house wine to 7,000€ for the 1997 Pétrus. The 2001 Masseto is 3,500€, and its 1999 vintage – which I have just had the privilege of drinking at home and which I found to be complex and profoundly impressive, with notes of stewed damsons, leather and cinnamon – is 1,950€. Other bottles to catch my eye were: Cristal 2005 (650€), Krug Grande Cuvée (590€), Luce 2005 (450€), Sassicaa 1997 (1,950€) and La Tâche 2004 (2,800€). I tried two interesting bottles. The white from the Veneto was bright, minerally and elegant (Angiolino Maule, Masieri, 2015) and my red was one of those brilliant, blackcurrant-laden super-Tuscans, loved the world over (Il Bruciato, 2013), which was ideal for the richness of the beef. Leaving, I felt that somehow the world had improved a little. This is what happens when you eat a fine dinner in congenial surroundings. And that is precisely what I had enjoyed at the Ristorante Da Ivo, The Perfect Italian Restaurant. Ramo dei Fuseri, 1809 San Marco, Venice 30124, Italy.